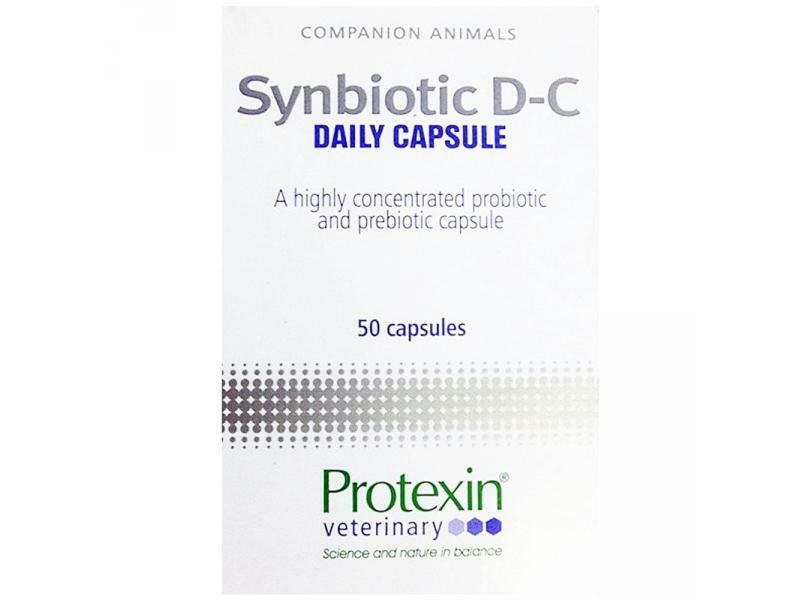 Protexin Synbiotic D-C is a super concentrated powder boasting pre and probiotic action. 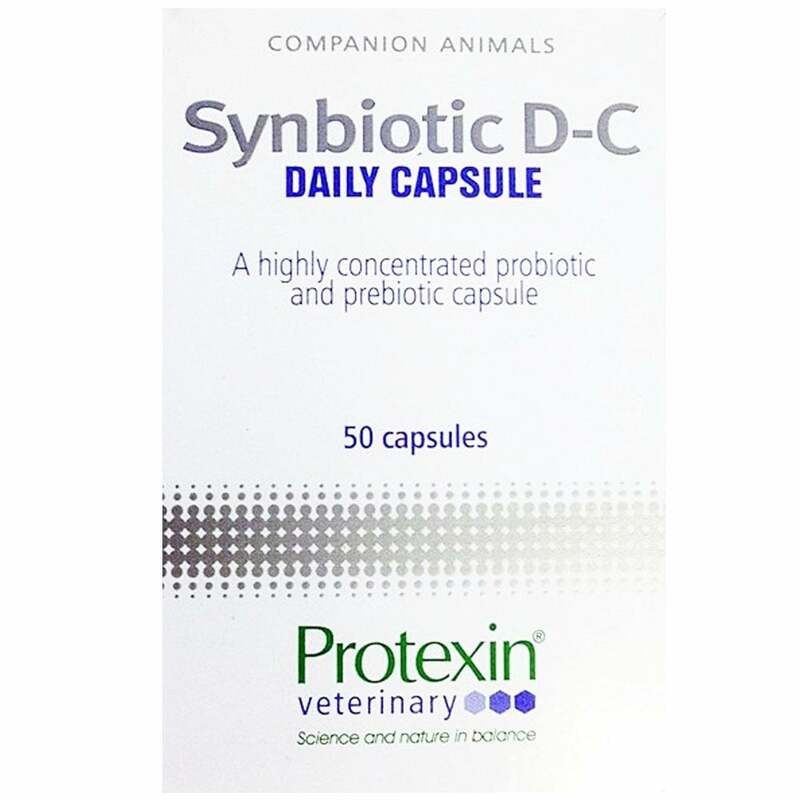 Synbiotic D-C restores the natural balance of gut microflora and promotes the normal functioning of the digestive system. Fed whole or broken and either sprinkled on food or dissolved in water, the capsules can be fed daily to restore normal digestive operations. Preplex prebiotic (Fructo-oligosaccharide) [40%], Gelatine capsule, Magnesium stearate. Enterococcus faecium (NCIMB 10415) E1707 1 x 1013 CFU/kg; 2 x 109 CFU/capsule. Preplex prebiotic - Acacia (Gum arabic) [40%]. Below are some recent questions we've received regarding Protexin Digestion Synbiotic, including answers from our team. Can these be taken with antibiotics? My Labrador has been suffering with gut infections and itchy skin problems over the past six months. My vet keeps prescribing him antibiotics which work short term but it just keeps coming back. 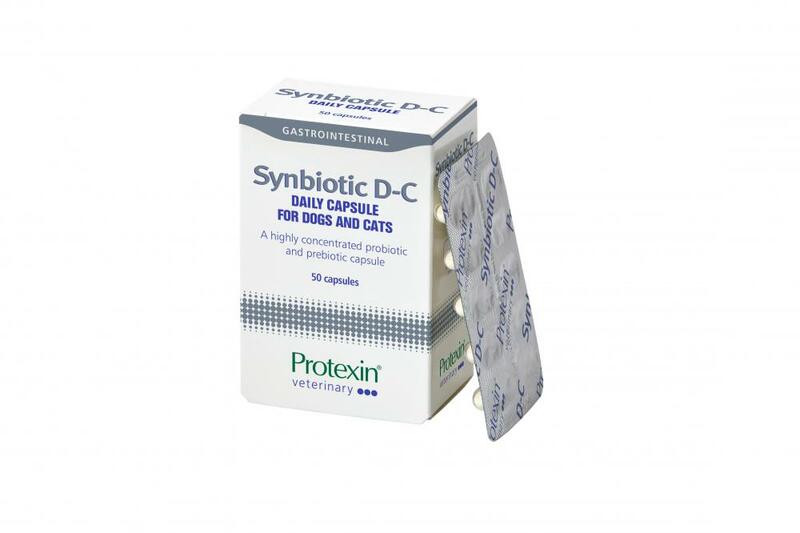 He is currently on a month long course and I am eager to get him started on the recently purchased Synbiotic D-C. Can they be taken alongside each other? I know that some probiotics for humans don't always work with antibiotics! It is much less likely to be helpful to give the probiotic at the same time as the antibiotics, so the usual advice is to start probiotics straight after the antibiotics finish. I wonder if the antibiotics seem to help (is any other treatment given at the same time, confusing the picture?) If the antibiotic helps the skin, then there must be some infection present at the time. If this keeps happening, there must be some underlying trigger to allow it to happen. In this case, the probiotic makes sense but is not likely to be the full answer. A skin supplement such as Yumega Plus would probably be beneficial too. An investigation into possible dietary allergy might make sense, especially if ongoiong itchiness is a feature of your dog's condition. I do not think this will work. If there is an ongoing infection in the mouth, there must be something preventing it from clearing up (foreign body, tooth root infection, abnormal growth etc). It might be that this needs finding and sorting out, then the infection will clear by itself. Sometimes though it can be very difficult to identify the underlying cause. In either case, I fear that this product will not make much difference. It would do no harm if you feel you have no other options and just wanted to try though. Can i give my dog the synbiotic capsual in the morning and an entrogenic sachet at night . Hes a lurcher with a really sensitive stomach and so far the sachets at night work but their very expensive to give two per day . It would be perfectly safe to do as you ask. You would have to see how it worked. These are very safe supplements and you will do no harm. It is always the hope that you can in time reduce the amount you give anyway. It is also worth looking at trialing different diets to see if they might be more easily digested. Depending on the underlying cause of the symptoms you observe, it is quite possible that this product would be effective. I certainly expect it would be safe, so it is perfectly OK to try it and see how you get on. Ideally if your dog suffers regular episodes of colitis then you and your vet should try and work out it there is a particular underlying cause which could be treated directly. Sometimes a suitable change in diet will be effective in fact. However as an alternative, you could certainly try this product. If it works, then you could continue giving it. Hi... Read somewhere that this product is to be used for small pets. Just wondered whether a dog weighing over 28kg can still benefit from this product? This product should be just as beneficial to large dogs as small, but you would probably need to increase the dose you give. I would suggest two capsules daily to a large dog. Okay for cats too ? The use of so-called prebiotics in cats has been the subject of less research than in dogs, but the work which has been done suggests that cats will benefit in a very similar way to dogs and other species. The bacterial population inhabiting the large intestine of cats is influenced positively by prebiotics and this is expected to be beneficial to general health as in other species. It is safe to use and could well be beneficial to your cats.